Dry roast all the ingredients given in the list 'To grind' until they turn golden brown..keep aside, let them cool...Grind as fine powder and keep aside..If u r using tamarind paste, make a tamarind juice with enough water..
Heat the gingelly oil, add the mustard seeds, urad dal, fenugreek seeds and curry leaves, fry everything until they turn brown, add the shallots,chopped tomatoes and saute until they turns transculent..meanwhile add the already prepared powder, chilly powder and salt to the tamarind extract..Add this spiced tamarind extract to the cooking veggies and let them cook in medium flame for few minutes until the oil gets separates..put off the stove..
Mouthwatering Priya!! This kuzambhu will be heavenly during cold/Chill, may be v can say this a reason to enjoy that spicy feeling!!!! mmm yummy!!! 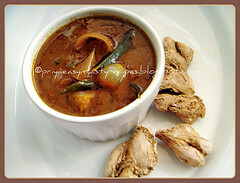 sure its a very gud home remedies...perfect curry.will try it soon. Priya, when I visit France I am going to stay in your home :). Such a wondeful recipe. Love the pic...hope u had a gr8 lunch with this kuzhambu. It is perfect for this cold weather. priya what a delicious one priya.ya its really good for health.mom used to prepare different varieties of dried gingerdishes..i like the chukku coffee..this is really yummy one..feel to have this. This is indeed mouth watering! That looks so so delicous, in kerala we have a curry with ginger but then with fresh ones, it is not raining here but i still wish i had this with hot rice. Perfect with rice! mouth watering recipe! Lovely Kuzhambhu. I love the fact that this has plenty of ginger and tamarind in it. The photo looks fabulous too! Nice healthy dish. I liked very much. A rich and delicious gravy! Priya..Kuzhambu is very tempting..chance illa !!!! WOW..that looks so tempting priya..love to hv some now...thnx for sharing this! This dish is new to me. Wonderful recipe and pic, Priya..
whats gingelly oil btw ??? Woww... healthy one.. looks very tempting.. gr8 job!! My favorite kulambu. Yours look very authentic and delicious dear. I heard of it but never tasted, I guess it will be great for my sneeze.....The pict looks tasty! Nutritious n healthy recipe...loved your authentic preparation. Looks very tempting and healthy too. Priya send some please, it is raining hot and nothing to beat this with some steaming rice. You are always amazing with your wide range of recipes, from authentic to international. Hats off. A very good stomach conditioner nice recipe. Never had this but it looks delicious. Just reading that title made my insides all fiery! What a delicious idea, Priya-- incredible. Bookmarking this one , sound so delicious. Sounds really tempting!! Great pic too! There are not enough meals in a week to make all the delicious stuff everyone constantly produces on blogosphere! :) Cheers and have a great day! It simply looks delicious and never knew we can prepare a curry kind of thing with this dry ginger. I am sure it is full of medicinal values. Lovely idea. This is such a healthy dish. looks great Priya! So helpful for colds. such a gravy is new for me.. is mouthwatering! liked ur version of garlic chutney! Nice and healthy ginger chutney. Not big fan of ginger and family ;) But kuzhambu looks delicious! looks so tempting. i love this curry very much. yumm. cute clicks & nice gravy!! Healthy and perfect for rainy days! Love to have it when caught up with cold..Nice presentation. Wow Priya! This look absolutely delicious! Priya, can you use fresh ginger instead of dry ginger? is that an option? thanks for your reply. where do you get the dry ginger from, or do you just dry out fresh ginger?